Package includes: two lights, two shepherd hooks. Easy to install, push the stake on the unit down into soft earth, or hang it in the branches. 2. There's an INSULATION TRIP on the light cover, turn 30 degrees counterclockwise to separate the light, make sure TAKE INSULATION TRIP OUT before charging. 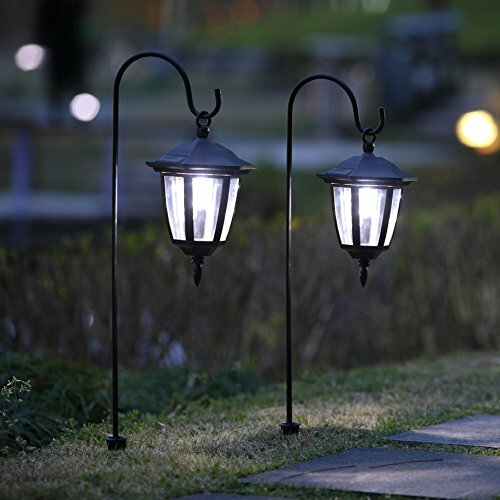 Decorative--suitable for outdoor use, add a charming ambience, perfect use on pathways, decorate your garden, porch or yard. 4 lumens, IS DESIGNED FOR DECORATION, MAYBE NOT BRIGHT ENOUGH BUT GENTLE. Measures 26 inches from top to bottom, above ground height after installation is approximately 20 inches, depending on the depth you install the stake. When you receive solar lights, please remove insulation trip then cover the solar panel by hand to keep them in the darkness to check whether the lights will light up or not. 100% SATISFACTION GUARANTEE - With 180 days product warranty, if you have any questions, please contact us, we would be more than happy to assist.